Bursting with all the drama and energy of a rock concert, in a fun, lively and exciting environment, WWE live events are the ultimate in family entertainment! 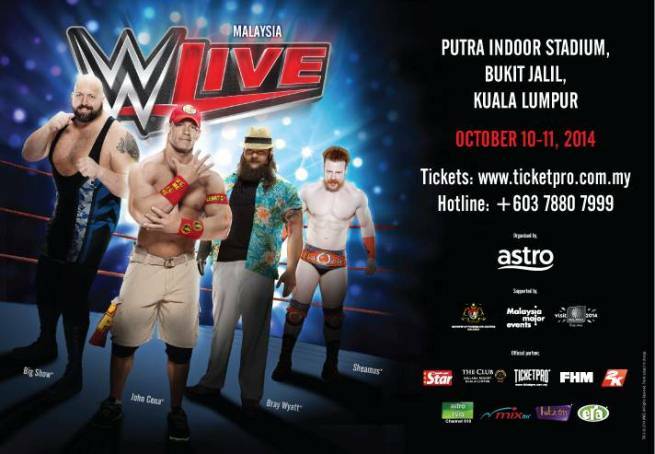 Fans will be able to see their favourite WWE Superstars® live, including John Cena, Bray Wyatt and the Wyatt Family, Roman Reigns, Dean Ambrose, Seth Rollins, Intercontinental Champion – Bad News Barrett and many more. Malaysia will be the exclusive country in South East Asia to organize a WWE event in 2014.